Last month, I had the chance to hang out with students and faculty at the University of Tampa for a two-day collaborative printmaking workshop. The workshop was the third iteration and expansion of FLOCK, an art project from The Language of Watching in which participants & I talk about birds, sometimes go birdwatching, and always make bird prints. Every time I have an opportunity to expand FLOCK, it always goes a bit differently, depending on the group I’m working with as well as the space & time we have, but there are always lively interactions & bursts of creativity. An assortment of field guides I have collected since 2015. I begin by sharing what I am doing in my practice to examine our human relationship with nature. I pass around my collection of field guides while we chat about them. I always learn a lot about how others are navigating the complexities of of developed environment, and I hear about what they may notice and not notice about nature. I am always surprised that simply by talking about these things, I leave feeling more aware than ever about my own surroundings. Bird song became a topic of discussion at UT thanks to a gift from my mom. This summer, she gave me used copy of The Bible of Bird Song and I was able to play songs from a variety of birds for FLOCK participants. 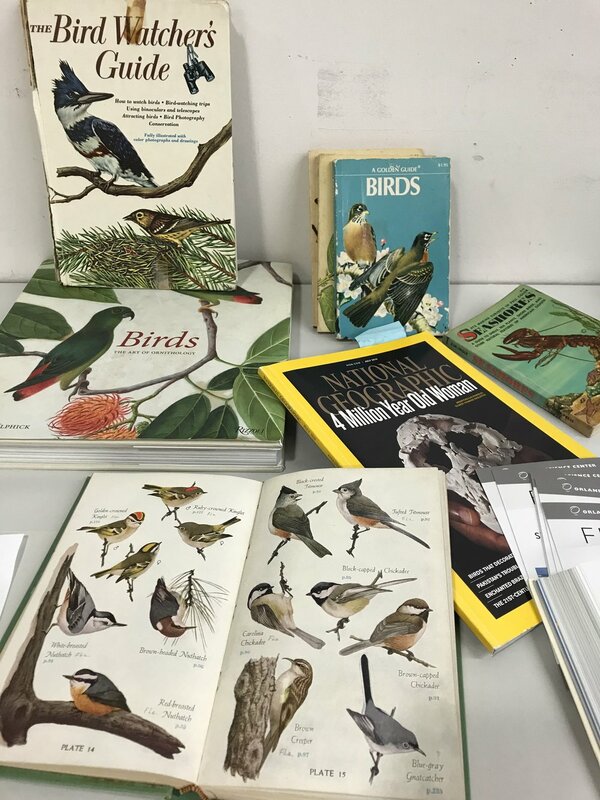 One or two of the students even used the book to identity birds they had heard and seen but could not name. Of course, there are plenty of apps that can play bird songs, but The Bible of Bird Song is special— it is a book with a digital sound player which allows one to turn the pages of a book, rather than click through a series of menus. As a book artist, I loved sharing this book and seeing how the UT students seemed to enjoy it, too. There just might be something fundamentally more satisfying in turning the pages of a book versus navigating a screen. The UT workshop was also different because it was a large group (around 75 participants spread out over two days) and many were interested in art, design and some specifically in printmaking. The project has what I think of as built-in opportunities for creative experimentation, as it asks participants to think about their experiences with birds, chose silhouettes, colors and patterns that suit their own aesthetic preferences within the limitations of the project. In other words, they have choices (which birds, which textures, which colors, which layer goes first, second, third), but they do not have an infinite number of choices. I find the space that lies between absolute freedom and guided limitation provides inspiration & spurs innovation. It presents one with a visual problem with thousands of solutions, and no one solution is privileged over another. One formula might be kingfisher + stripes + split run/rainbow roll on black paper, while another might be stripes + kingfisher + green on brown paper. Visually, thew results will always be compelling, and experimentally, this combining and recombining is the way to jump from one idea to another in a very short amount of time. The prints are passed around from person to person, and between groups, so no one owns any of the decisions, and everyone can contribute anything to any of the prints. Professor Ry McCullough organizes the flow of traffic on the press at The University of Tampa during FLOCK. FLOCK is an evolving project, one which continues to generate meaningful human-to-human interactions and opportunities for creative problem-solving. I simply set some things in motion two years ago and since then project has taken on its own identity. Since 2015, FLOCK has become a collective work in which participants are encouraged to think about birds, birdsong and bird behaviors as something more than a side note, but as an essential element of their daily experiences of being part of the natural world. At the same time, the project exists as an opportunity for conversation, sharing stories, and for engaging in a collective kind of creativity that opens up new ways of thinking and making for myself & the participants. Many, many, thanks to Ry McCullough and the students at The University of Tampa for creating such a great opportunity to do this project! I had an awesome time! The ever-expanding FLOCK at the Orlando Science Center, image taken November 17, 2017.